It is Thanksgiving-time and a couple of drinks suggest themselves. The Thanksgiving Toddy is found in the bar book compiled by Waldorf Hotel bartender Joseph Taylor between 1894 and 1920. It is one of the cocktail-like drinks in that source with the line “no bitters.” The cocktail was also known as the bittered sling, and if you leave bitters out of one, it just falls back into being a sling, or a toddy if it is garnished with citrus zest. The orange zest in the source makes it very clear. The Thanksgiving Toddy is a very appropriate drink in that last hour before sitting down to a traditional Thanksgiving dinner. I recommend cutting two strips of orange zest as free of pith as possible and actually stirring one of them with the rest of the drink before straining. Postscript – In a few weeks, the Army & Navy game will be upon us, so here are the Army & Navy Sour and the Army & Navy Cocktail. 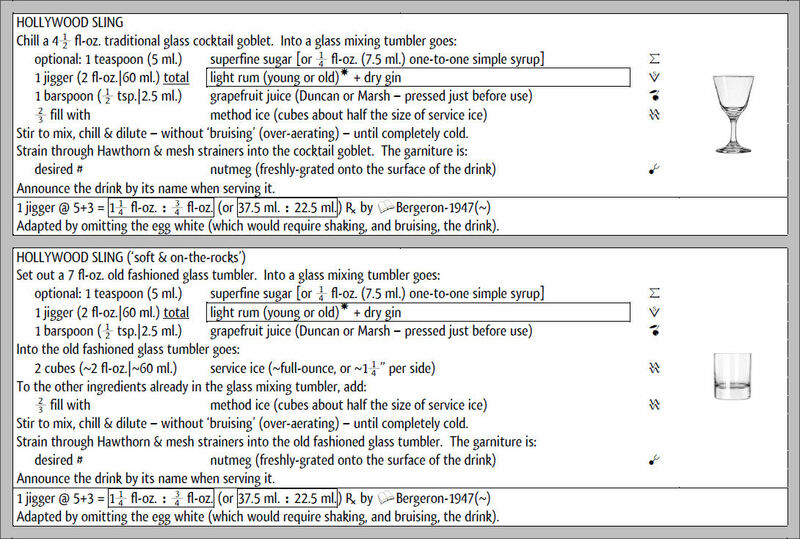 I adapted the cocktail from the original sour (found in David Embury’s 1948 book, “The Fine Art of Mixing Drinks”) by adding bitters and scaling back the critical ingredients to cocktail-appropriate amounts. The Big Three Package Deal discount has been added to the Elemental Mixology Storefront. Anyone purchasing one spot each in the Standard Drinks Course, the Liquor Course and the Fabrication Course at the same time who enters the coupon code THREEINONE will get a $100 discount. This discount will probably not be permanent, so make use of it now! The label describes Cordial-Médoc liqueur as being, “Prepared with superior products, allied with exquisite fruit and brandies specially selected for their fineness and aroma” [my translation]. The bottle says “depuis 1878,” but I can’t find Cordial-Médoc liqueur in any English-language drink books from before prohibition. No matter when it may have first been produced, it is fading away right now. Jourde is apparently not making the stuff anymore, and the remaining stocks are all that there will be. Since it is an ingredient that I have found in books (especially Tarling’s 1937 The Café Royal Cocktail Book), I thought that I would get a bottle of it. It tastes to me like it might be raspberry eau-de-vie blended with brandywine and with some herbal accents added at some point during manufacture. I would think of it as being mostly high-quality raspberry-flavored brandy liqueur with a little something extra. It is quite good. Nothing about this liqueur overwhelms the palate, and to enjoy its subtle-but-varied flavor I should think it would be best served neat (as an after-dinner cordial), or perhaps as an accent to an-otherwise very plain mixed drink. If I had to create a substitute for Cordial-Médoc liqueur using things that can be reliably found, I would experiment with mixing raspberry eau-de-vie with Cognac brandy, sugar syrup, and just a touch of a non-bitter herbal liqueur (such as Bénédictine). I might even try a more simple blend of Cognac brandy, crème de framboise and Bénédictine — but I suspect that this would produce something noticeably sweeter than the original. If I find an analogous formula, I will share it. Today’s drink of the day is the Hollywood Sling. It is found in Victor (‘Trader Vic’) Bergeron’s 1947 “Bar-tender’s Guide.” Of course, he errantly considered the drink a cocktail, as could be expected from any source after about 1910. But, I’m going to pretend that prohibition never happened so that I don’t have to explain to Americans (including Trader Vic’s ghost) the differences between two of their most historically seminal types of drinks: cocktails (bittered slings) and regular slings (with spice instead of bitters). Nor do I feel like explaining that over a hundred years ago, foreigners took to calling any drink they wished to seem like an American drink a ‘sling,’ even though it was usually a punch like the Singapore so-called Sling or the fixes that Heering refers to as slings on their website. Think of the foreign mis-appropriation of the word ‘sling’ (in its drink-related meaning) in the same light as the many decades of calling all drinks ‘cocktails.’ When ignorance and pretense are combined, pity-worthy vocabulary usually ensues. That said, today’s drink is exactly a sling, according to the old American tradition. What alienates Bergeron’s ‘mixology’ even further from pre-prohibition standards than his vocabulary was his complete abandonment of the jigger (2 fl-oz.) as the total amount of liquor in mixed drinks. Drink books maintained the jigger through the 1930’s, and had Trader Vic published his recipes just a decade earlier, many of his drinks would have seemed cheap or skimpy and a few others would have seemed profligate. Now that all of that grumpyness has been exorcised, I will get on to the drink, itself. Of course, I have re-jiggered it and given it its proper family name (sling). I recommend using Matusalem platino or clasico as the light rum. I presume that enough gin preference exists that I need not recommend anything there. As far as service is concerned, Trader Vic mentions no ice, which should lead one to use a goblet so that the stem can help keep the hand from cooking the drink. But, he indicated an old-fashioned glass tumbler, which should be suggestive of ice. I present it two ways – the way I would drink it, and another way for men who feel that they need a tumbler as an accessory to their gender image. That might not be a fair observation. Let me be more reasonable. If you plan on taking a good while with this drink, make it soft and on-the-rocks so that it will stay cold longer – at the cost of becoming ever more-watery in your hot hand. If you want it to remain full-strength no-matter-what, make this drink ‘up’ and finish it in a reasonable amount of time before it can get warm. The juice in this one is an accent only – just like the few drops or single barspoon found in the original recipes for such bittered slings (cocktails) as the Brandy Crusta, the Bronx Cocktail and the Pegu Club Cocktail (just to name a few). Don’t assume that there was some sort of fruit shortage in bars of the past. Don’t ruin this drink like so many bar-keeps and bar-creatures have ruined those other drinks by putting in too much juice! Not even Trader Vic did that to this drink. As is appropriate for all slings and cocktails, let the liquor be the star here. Please click on the image to enlarge and clarify it.